Going through a painful dental emergency is never easy or fun. 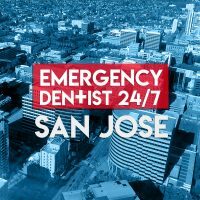 Resources can often seem limited, and we don’t have to tell you how frustrating it is to book an appointment with an emergency dentist in San Jose. Fortunately for you, you don’t have to! 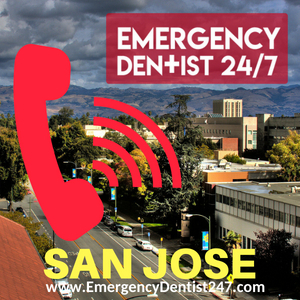 By giving us a call today at (669) 900-1527 and giving us the details of your emergency situation, we can have an appointment booked with one of the local emergency dentists in our network is as little as 24 hours, so don’t wait another minute! Remember to Bring These to Your Appointment! Considering it’s probably your first time visiting the emergency dentist, make sure you arrive at least 15 minutes before your appointment is due to start so you can fill out any necessary paperwork they may have for you without cutting into your appointment. If you have any dental records from previous appointments with your regular dentist or another emergency dentist, bring those with you. They will help your emergency dentist and their staff get a feeling of the work you’ve had done, when it was done, etc. One of the most important things you need to do before you go to your emergency appointment is to check whether or not the emergency dentist will accept your insurance. If they do, bring all of the necessary information with you and give it to their team so they can make and process your insurance claim while you are receiving your treatment. Unfortunately, not all emergency dentists will be able to accept your insurance coverage. If the emergency dentist we’ve booked you an appointment with doesn’t, make sure you ask how much your appointment is going to cost, or at least a general price range so you know what to expect to a certain degree. Bringing a list of the medications you’re on and the allergies you have, if either are applicable, is very important. The last thing your emergency dentist wants to do is cause you to have some type of reaction to something he or she uses during your appointment, so make sure they are aware of any medications and/or allergies. Once you’re in the emergency dentist’s chair, now is the perfect time to let him or her and their team know if you have any fears or general anxieties about the dentist. Once they’re aware of this, they will take steps throughout your entire appointment to make sure you’re comfortable, explain treatments and procedures in vivid detail, and check on you by asking how you’re doing very frequently. 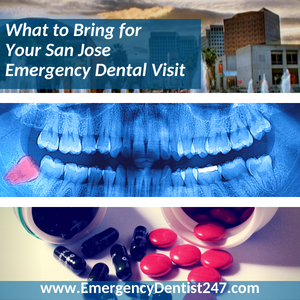 If same day denture repair in San Jose or emergency denture repair San Jose is what you’re looking for, you’ve landed in the right spot. Your dentures can be restored to their former, newer glory during a single appointment. We can also have you fitted for a new set of dentures during one appointment, as well! Our same day services are made possible due to the emergency dentists and denture lab technicians within our emergency referral network. Dental emergencies are annoying, rude, and painful wrapped up in one. They don’t care that you have to speak during your work meeting tomorrow. Asking them nicely isn’t going to make the pain stop, but we can! You may only think of a dental emergency as a tooth that has been knocked out or injuries to the tissue of your mouth, but that’s not all they are. You can easily be thrown into a dental emergency when a cluster of underlying, possibly unknown, issues snowball into one big problem. A great, and typical, example of this is an abscessed tooth. 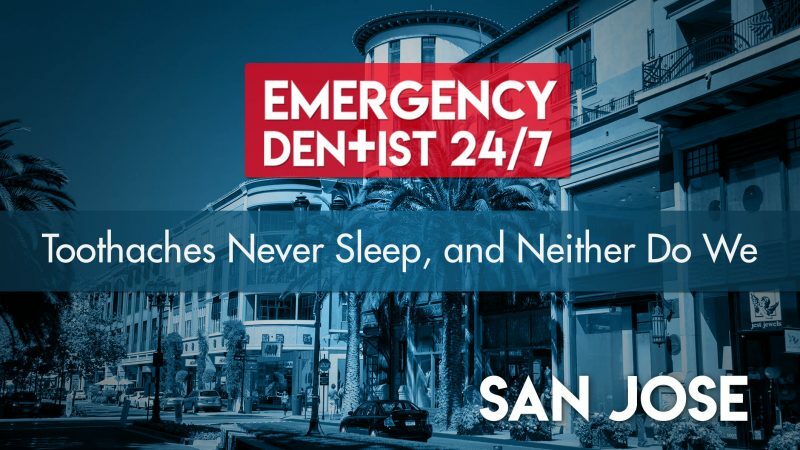 Keep in mind, however, knowing the difference between an emergency that needs to be seen by an emergency dentist and one that needs to be seen by an emergency room is important. If you’ve received trauma to your head, for example, you need to be treated in your local hospital’s emergency room by a doctor. If you’ve lost your tooth as a result of a fight, a car accident, or even just falling down the stairs, the first thing you need to do is make sure you don’t have any head trauma. If, when standing, you feel dizzy, out of sorts, or are bleeding, you need to go straight to the emergency room. Otherwise, start looking for that tooth! Once you’ve found it, pick it up very carefully by the crown. 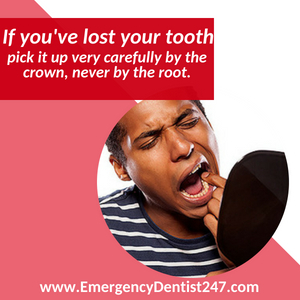 You should never pick up a lost tooth by the root to ensure that it doesn’t become damaged and a lost cause. 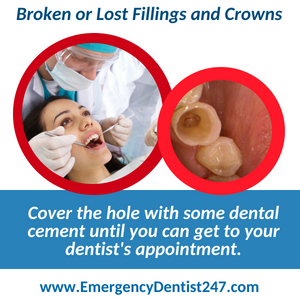 The emergency dentist we book you an appointment with can save your tooth and implant it back in, but only if the root of the tooth isn’t damaged and it’s decently preserved. To preserve the tooth to the best of your ability, you can try and place it back into the empty socket. This will only work if the root of the tooth and the empty socket haven’t taken too much damage, though. If you’re unable to keep it preserved in its original socket, the next best thing to do is put it in a cup of milk or water. Preserving the tooth using either method is very important if you want the emergency dentist to be able to safely implant it back into the empty socket. Oral infections are a nasty dental emergency that can’t be dealt with on your own. They can be destructive to not only your oral health but your bodily health, as well. Your oral health is a direct reflection on how the rest of your body is doing, so leaving an oral infection to run rampant can turn from a dental emergency to a life-threatening, ER emergency. 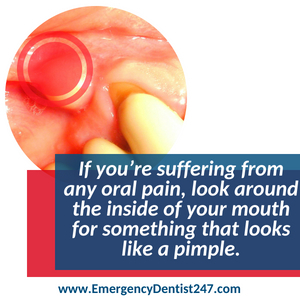 If you’re suffering from any oral pain, look around the inside of your mouth for something that looks like a pimple. If you find one, you must call us immediately so we can have an appointment booked for you. Unfortunately, oral infections aren’t always easily spotted. This is due to the fact that they can hide in your teeth. An abscessed tooth occurs when one of your teeth badly chips along your gum line, creating an entrance for infection to move into. Your toothbrush and/or mouthwash won’t be able to save you now, only an emergency dentist can. If you’re dealing with a broken or lost filling or crown, you need to act quickly, so begin by calling us as soon as your filling or crown has broken or has fallen out. What you need to do next is go out and buy some dental cement, use a small piece of gauze, or even use a cotton ball to plug up the hole in your tooth that was once covered. If you wait too long to call us for an appointment straight away and don’t use something to cover the hole, you’re going to be in big trouble. Leaving it uncovered will result in the tooth becoming so damaged that, by the time you do get an appointment, the emergency dentist will not be able to save the tooth. He or she will be forced to extract it, instead. If the thought of having a tooth pulled alone is enough to make you squirm, we know how you’re feeling about actually having to get it done. Thankfully, the emergency dentists and staff in our network understand your fears. Your emergency dentist and their staff will do everything in their power to save the tooth, so don’t abandon all hope yet. In fact, a lot of teeth have been saved from being extracted at the last minute, so have some trust and faith in your emergency dentist. Unfortunately, sometimes the tooth still has to come out, even after all of the efforts to save it made by your emergency dentist. 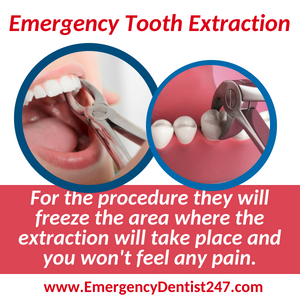 The process of having a tooth extracted begins with your emergency dentist completely freezing the extraction area. This means that you will only feel some minor pressure when he or she goes to pull it, but you won’t feel any pain whatsoever. Using a set of not-so-scary dental pliers, he or she will take hold of the tooth in its socket, and carefully rock it around until it pops out. If the tooth proves to be a challenge, he or she will gently break it up into smaller pieces and remove it using this alternative method. No matter what happened to you, be it a fight or an accident, it’s very important that you go to the right place to seek help first. If you’ve received head trauma you need to visit an emergency doctor at your hospital’s local emergency room as soon as you can. Once you arrive, or while you’re on your way there, call us so we can get you an appointment with an emergency dentist quickly while you receive treatment with an emergency doctor. If you have broken teeth, lost teeth, or whatever the case may be with your oral health, call us immediately. We are the fastest way to get help from an emergency doctor.